Earlier in the day I went for a swim at Woorim Beach and when I was drying out near the car, I spotted 2 Buff-banded Rail in Lions Park. They were just looking for dinner on the grass and at one stage, one came to about three meters away from me. Later on in the afternoon, just before sunset, I walked along the road to the Sewerage Treatment Works. It was suggested to me by a local birder, Robin, whom I had met in the library this morning. It is not a bad spot for birding. There were the usual heap of Rainbow Lorikeets and quite a few Brown Honeyeaters. 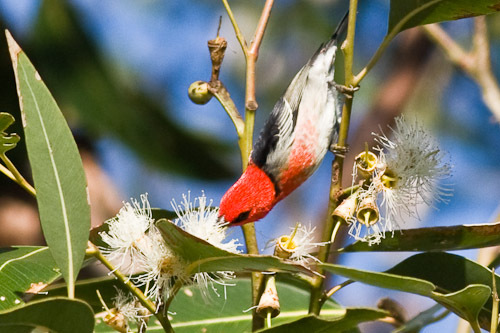 A couple of Noisy Friarbirds were also feeding on the eucalypt blossoms. 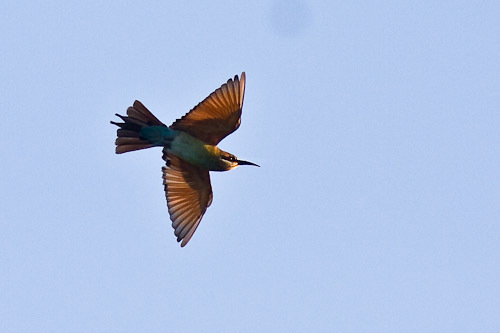 Right down the end of the road, I was delighted to come across about four Rainbow Bee-eaters. I love these birds. They are so elegant and beautiful. I could photograph them all day. 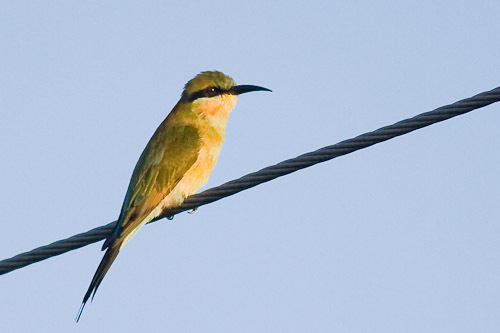 They were sitting on the electricity wires and swooping down on insect and then alighting back onto the wires. I think this one is a female because it has the shorter tail extensions. I was super stoked to get a shot of one in flight. I think this one is a female or a juvenile as well because of the shorter tail extensions again. The next morning I got going early along the sewerage road. 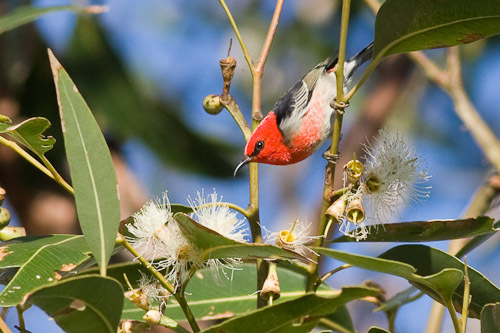 I spotted a Little Friarbird and then a heap of Scarlet Honeyeaters who were feeding in the small gum trees on the blossoms. 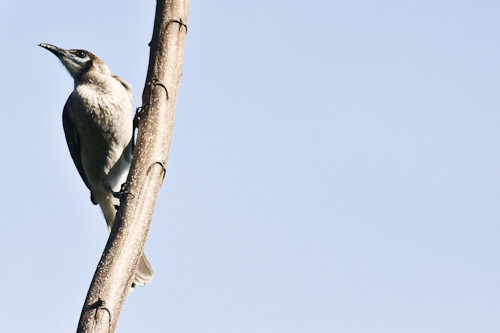 They were being chased around by the Brown Honeyeaters who are just a little bit bigger. And I particularly like this photo. I did not do anything to it except crop and bring a few of the highlights down a bit. Very happy with this. I hope you like it too. Down the end of the road I spotted a few White-throated Honeyeaters. 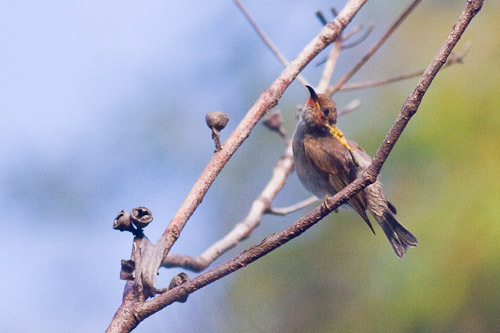 They are very similar to the White-naped Honeyeaters except that they do not have the red around the eyes. A Bar-shouldered Dove flew up from the side of the road to the wires and some Double-barred Finch did the same thing. 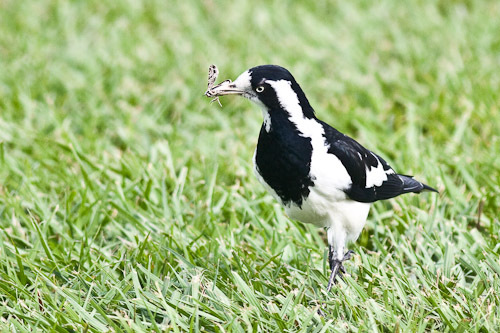 Around the football field I saw a few Magpie Goose, Australian Wood Duck and Masked Lapwing, as well as a Forest Kingfisher lurking in the trees near a water-way. 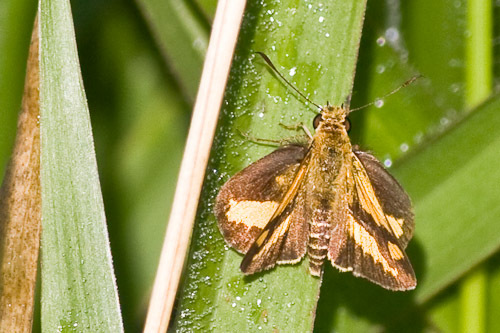 And another as yet unidentified butterfly , or could it be a moth? I stopped at the Arts Centre and went for a walk along the Bi-centennial tracks. There were quite a few Noisy Friarbirds, Scaly-breasted Lorikeet and Rainbow Lorikeets feeding on the blossoms in the trees around the centre. The country around there is mainly banksia and melaleuca swamp type habitat. At one spot there were quite a few honeyeaters like Lewins Honeyeater, Brown Honeyeater and Scarlet Honeyeater as well as some Mistletoebirds. I happened to spot this butterfly who landed on a branch. It was amazing how well the camouflage was on it. 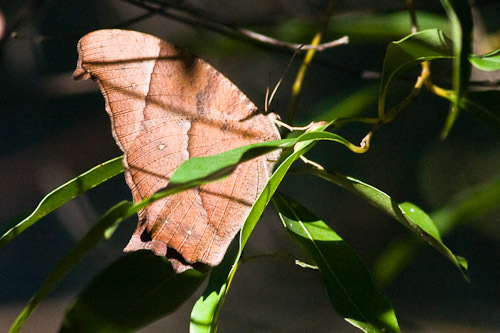 It looks so much like a leaf, its uncanny. It even has the veins of the leaf. After the walks, I went down to the Banksia Beach Bird Sanctuary that is on the foreshore at Pumicestone Passage. There is a hide and a walk. There were Masked Lapwing, Red-capped Plover, Pied Oystercatcher and Caspian Tern roosting on the sand. 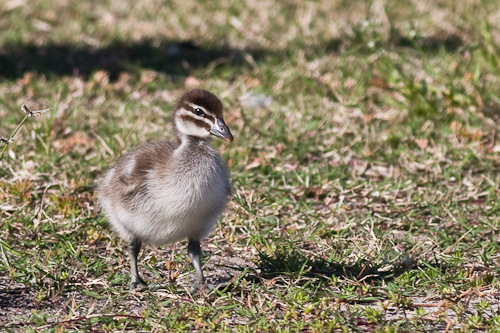 Further up I spotted some Brown Honeyeaters and this lovely Australian Wood Duck chick and her parents. Buckleys Hole is at the south end of Bribie Island. It is a waterhole or a billabong pretty close to the ocean. I think it is fresh water because there were fresh water birds in there. 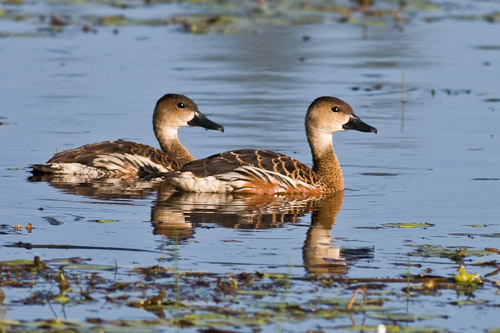 First up for the birds is the Wandering Whistling Duck. Here is a shot of it standing up showing the side feathers. And here they are in the water. There is a hide at the water hole. 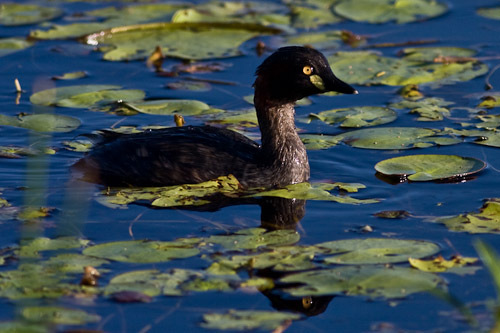 I was in it, hiding when this Australasian Grebe popped up right in front of me. 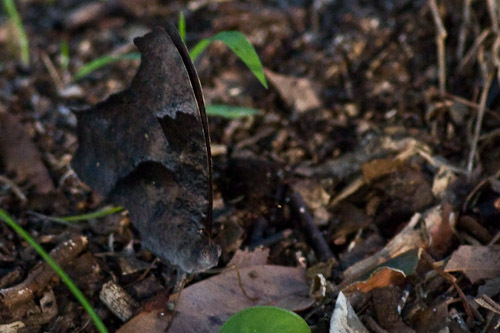 This butterfly was incredibly well camouflaged. It is a really crap photo but the butterfly is so amazing I had to chuck it in. A new butterfly. Not sure of name yet. Here is the back on shot. I dont know the technical name for this type of shot. 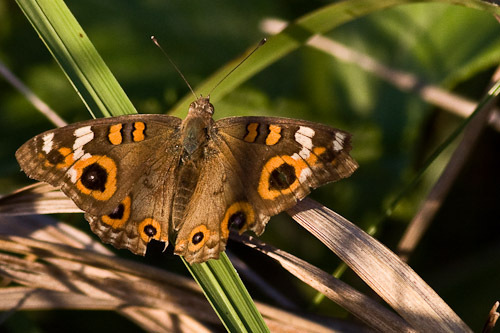 Edit: Its a Meadow Argus. Thanks Christina. And here is the side on shot of the butterfly above. 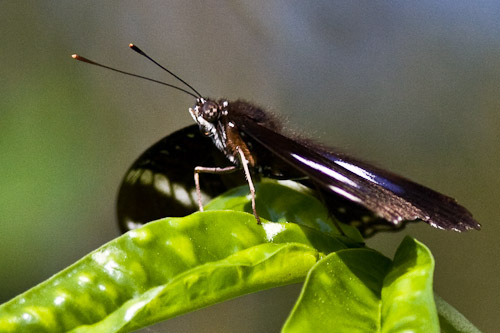 I am going to have to start a butterfly list as well as a bird list at the rate I am going. Toorbul is just around the corner from Caloundra along the Pumicestone Passage, that separates Bribie Island from the mainland. But you have to go out to the highway and then go back in to get there. This morning I woke up to mudflats stretching to eternity. But the birds were too far away to see, so I had breakfast and waited for the tide to come up a bit. I was quite surprised that the migratory waders were still there and had not jetted off to the Arctic yet. And strangely, they were not real coloured up or fat yet. What is going on, I thought. The main waders were Bar-tailed Godwits, Grey-tailed Tattlers, Curlew Sandpipers and Eastern Curlews. There were more than twenty Pied Oystercatchers as well as about half a dozen Royal Spoonbill as well. In the bushes next to the water front I spotted a Striated Pardalote and it was the northern race, melanocephalus. I thought he looked a bit different. 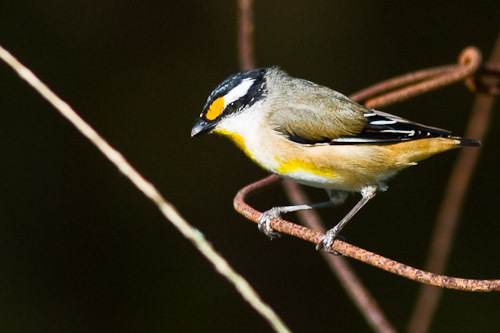 They are commonly called the “Black-headed Pardalote” and have a darker black head without so many stripes along the top of the head and the cheeks. But anyway, I was stoked. I always like to see the different races. 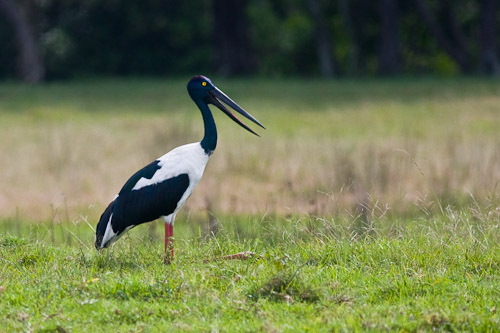 I headed out of Toorbul and stopped on the side of the road because I spotted a Black-necked Stork in a paddock. Then later on, I followed a dirt track and saw 2 Brolga in a paddock having a good feed. They were a bit far away for decent photos. Whenever you get close to them, they just move away. doh! 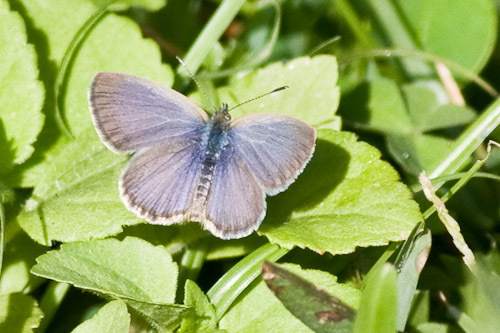 And another species of butterfly. I do not know what type it is yet, the internet is as slow as a wet weekend so I have not been able to identify it yet. double doh! Yesterday morning I headed off along the headland at Caloundra, starting from Shelley Beach and ending up at Kings Beach and then back again. At first I spotted 3 Sooty Oystercatchers and quite a few Crested Tern. Up in the pandanus palms, a Spangled Drongo was looking for insects. A grey morph Eastern Reef Egret was trying to steal some bait from a fisherman’s bucket. He flew up into a pandanus palm. I could see that he had lost a foot. I later talked to a bird counter who said that someone had caught him and had amputated his foot because it had fishing line all caught around it and was hanging off, dead. These fisherman really ought to dispose of their fishing line properly. I have seen so many birds who have either lost legs or have line all tangled up around their feet. 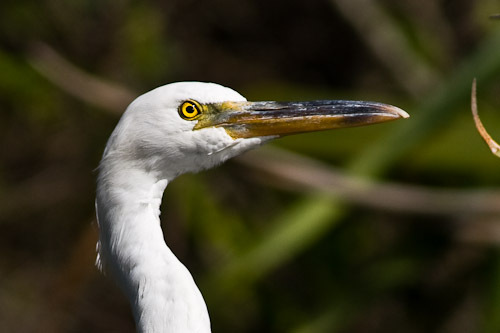 The grey morph was hanging about with a white morph Eastern Reef Egret, who was also roosting up on the pandanus palm. 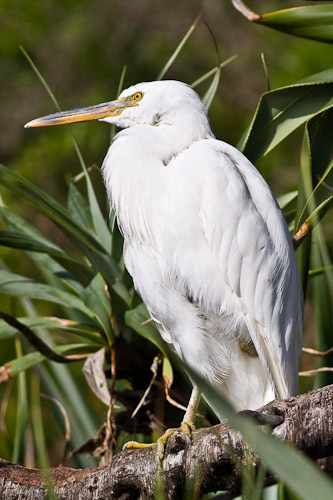 I had thought it was an Intermediate Egret, doh! Here is a nice close up so you can see the large bill. 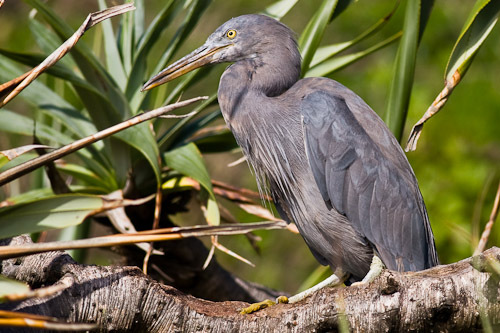 The Eastern Reef Egret is found along the coastal regions of eastern and South-east Asia, New Guinea and the south-west Pacific. 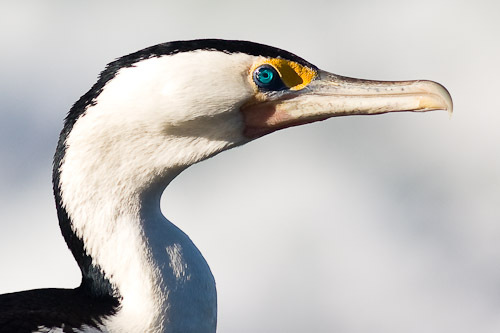 They feed on fish, marine crustaceans, molluscs and small land animals. 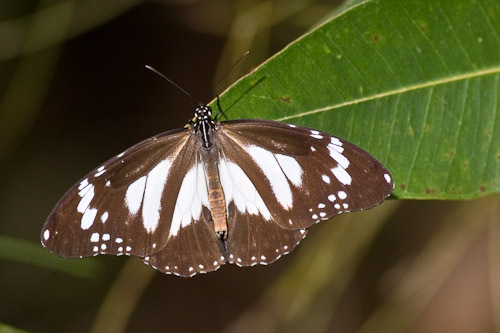 The grey morph is more common south of Queensland, while the white morph is more common north of the Barrier Reef. There were also a couple of Pied Cormorants who were roosting on the rocks just next to the ocean. I was able to get nice and close for this close-up/portrait shot. 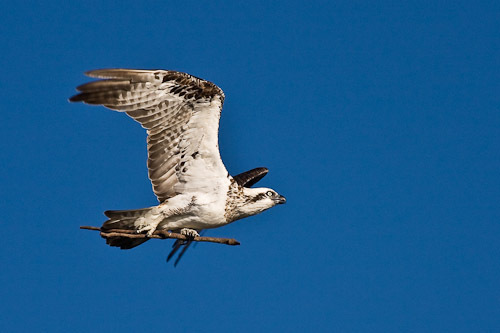 There were Ospreys everywhere. I spotted a few with fish and even saw one swoop in and catch what looked like a luderick. 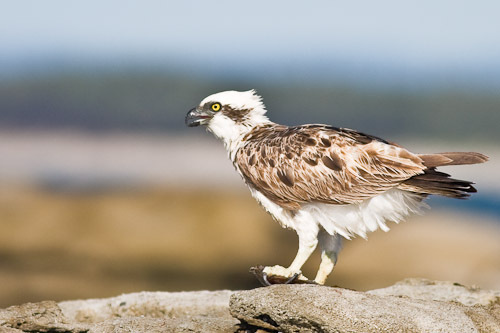 The Ospreys were eating on rocks just next to the ocean. This one was tearing into a yummy fish. This one is just hanging on to a very big fish. I think she is very near to the limits here. The fish looks like a trevally or similar. 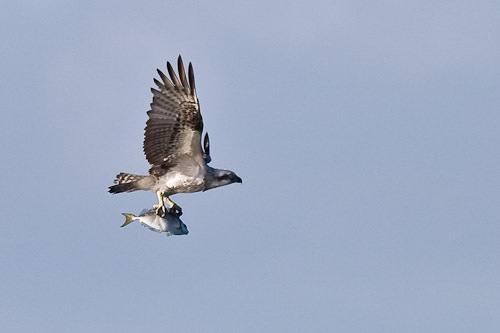 I think there may be a danger if a raptor catches a fish which is too large and they cannot unlatch their claws. They could drown if pulled down into the water. This one was bringing a stick back to the nest which was on top of a very tall pine tree overlooking Kings Beach. And to top it all off, this very nice lady who was a bird counter told me that where the Wandering Tattlers had been seen, so I followed her down to the spot and lo and behold there were two of them. So that is a tick for me. woot! Wandering Tattlers migrate to South-west Alaska and Siberia to breed and are most reliably distinguished from the Grey-tailed Tattler by its call. 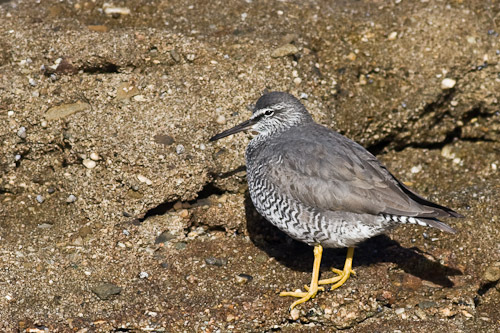 The Wandering Tattler is slightly larger, heavier and a darker grey, with extensive barring on all underparts. I am not sure exactly where I ended up, but there was a path and it went through the bush, so that was good enough for me. All that I knew was that I was on the eastern side of the bridge that went over they Weyba Creek. I was looking for the Weyba conservation area/park/thingie but I never found it. First thing I saw go over was a sea eagle, then I spotted some Noisy Miners and Crested Pigeons. A kookaburra was sitting up in a tree, some Masked Lapwings and Rainbow Lorikeets flew past, and I heard a few whipbirds. There were quite a few Noisy Friarbirds, as well as some Little Friarbirds who were quite keen on this one particular little tree. 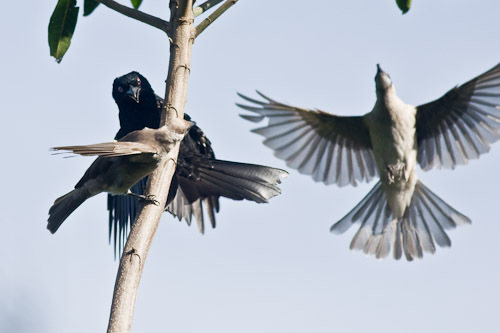 Then this Spangled Drongo busted in and wanted that tree for his own roost. I think there may have been some juicy insects hanging around that area, and it may have been prime real estate. It was Noosa Heads after all. 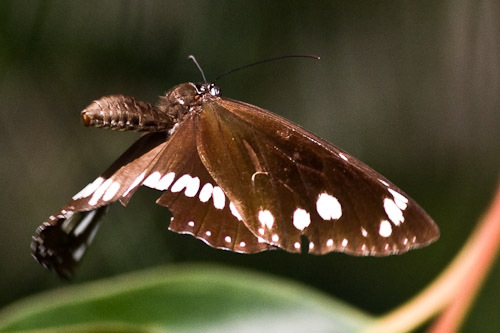 Seeing that I have been taking so many photos of butterflies lately, I have decided to dedicate a whole section to them. 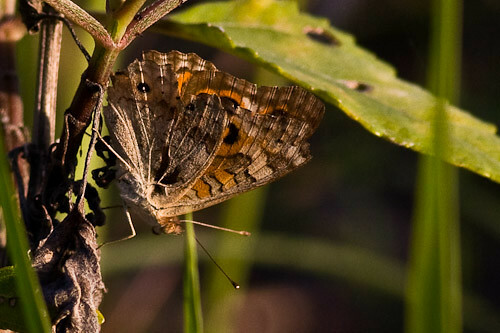 I am starting to really get into photographing butterflies. I may even have to start identifying them. I have no idea where to start. I may have to get a field guide or something, doh! Anyway I finally got a butterfly in flight, although it was hovering in the one spot. And I like this one because if you look closely you can see his weird little mouth and the eyes are all big and bug-eyed. And I do not think I have seen one of these before. 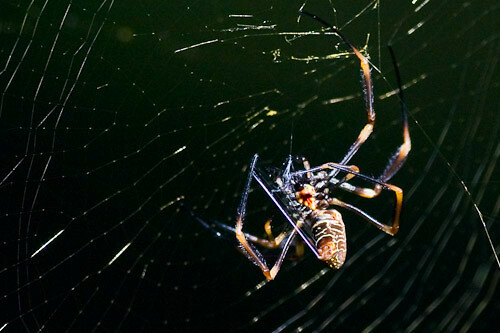 And for an added bonus, here is a shot of a spider wrapping up its prey in its web. You can see the sticky stuff coming out of its rear end. This morning I had a late start. I looked in on the Peregian Beach section of the Noosa National Park. To access this section go to the end of Woodland Drive in Peregian and just park there and walk through the gates to the National Park. When I first got there, I disturbed a pair of quail. I think they were Brown Quail but I did not get a good enough look for them. I searched where they came down, but they had disappeared. But there were plenty of butterflies around. 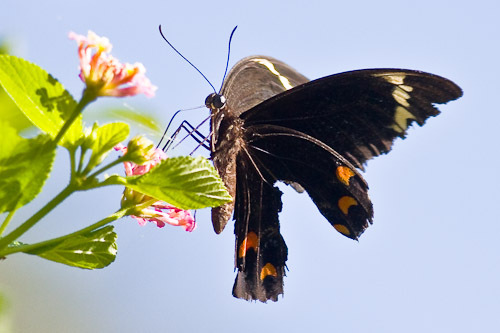 I took more photos of butterflies than birds. The country was mainly coastal heath and banskia, so there were plenty of Rainbow Lorikeets, Little Wattlebirds and White-cheeked Honeyeaters. I did hear a couple of whipbirds at various stages. The only birds of much interest were a flock of Double-barred Finch who took off when I was walking back along the track. 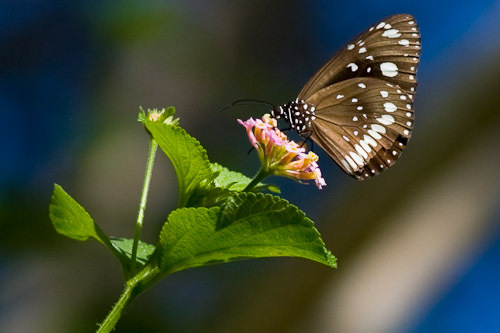 So thats all the birds, now back to the butterflies. 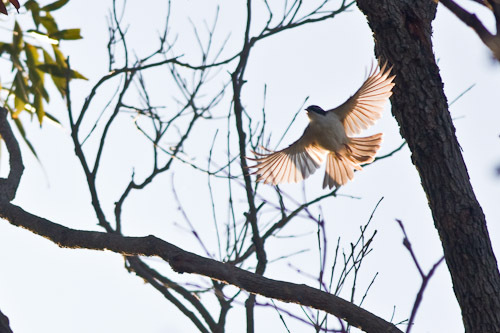 Here is another photo, of one hovering. It has been raining for days and days, so this morning was the first time I had been able to get my camera out. It is still a bit overcast with a few black clouds about. I was hoping that it would clear up today. The sun came out for a brief while this morning, but hope springs eternal. Caloundra is north of Brisbane and just south of Mooloolabah in Southern Queensland. It is basically the start of the Sunshine Coast. This morning the first thing I saw when I got out of bed was a pair of Brahminy Kites perched on a tree way over the water on Bribie Island. After breakfast I headed off along the walk towards Diamond Head, seeing lots of Noisy Miners, pelicans, ibis and kookaburras. Then I happened to meet a nice lady walking by who told me there were a pair of Tawny Frogmouths roosting in a tree around the corner. After a search by me and a few other passers-by, I finally spotted the pair up in a casuarina tree. 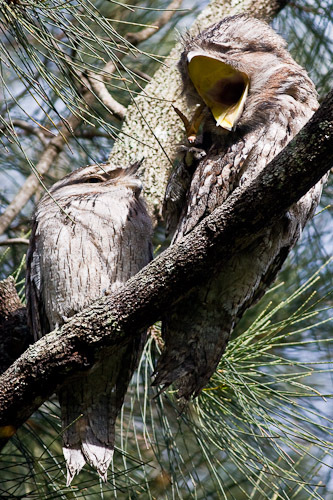 Tawny Frogmouths have a long lifespan and form permanent pairs. They usually stay in the one territory for a decade or longer. The locals were telling me this pair would come back every year and had done so for ages. 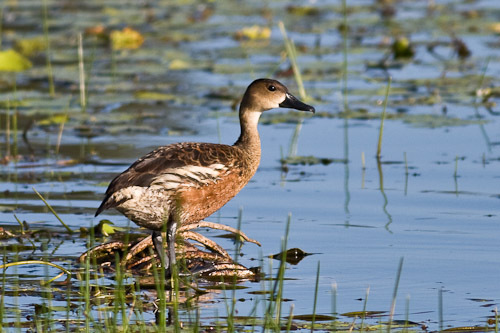 During the day, they will remain motionless on a roosting site for a length of time. 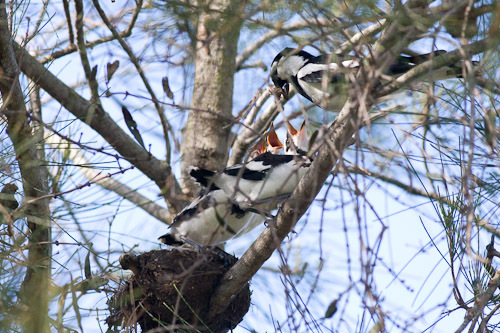 After that, I was blissfully walking back to my starting point, feeling very satisfied with myself, and these people told me they had seen a peewee’s nest with young chicks being fed. I went around the bend, and lo and behold, there they were. 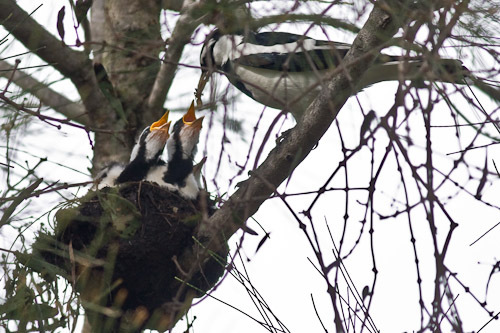 I think there were about 4 chicks and they would open their mouths wide in anticipation of mum and dad popping a yummy worm in their BIG mouths. And here are the chicks, about five days later, when I came back to Caloundra. They have grown heaps. And here is mum, hunting for some tucker for her babies. She seems to have a moth or a butterfly in her bill. I think they gather a few bugs in their bills before returning to the nest. All in all it was a great morning and finally after waiting days for the rain to stop, I got some decent photos of some very interesting behaviour. Too bad the weather is still looking grim, but at least the drought has finished in Queensland. 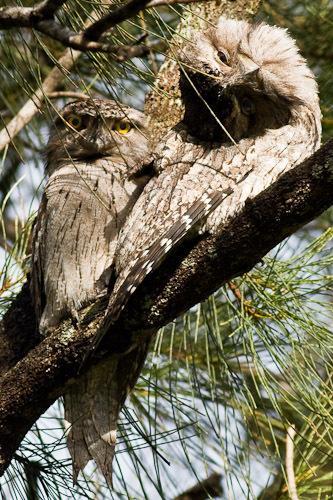 “Tawny Frogmouth” by Gisela Kaplan, CSIRO Publishing, 2007. The Lamington National Park is on the northern rim of the Mount Warning Shield Volcano which erupted millions of years ago. The Border Ranges National Park is on the western rim of the old crater. To get to the Green Mountains Section turn off at Nerang on the M1 motorway (between the Gold Coast and Brisbane) and follow the Beaudesert-Nerang Road towards Canungra. At Canungra turn left and head for the hills up a winding steep road, but be careful of all the mad drivers! O’Reilly’s Guest House is at the end of the road, as well as a camp ground. Make sure to book ahead for camp sites. Go to http://www.qld.gov.au/camping or ring 131304. I would highly recommend the camp site, it is cheap and has hot showers. The people at O’Reilly’s are really nice as well, so if you are loaded, stay there. 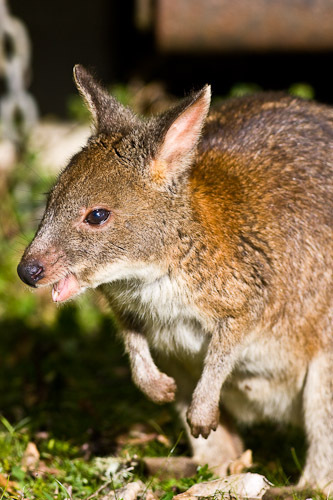 When I got there in the afternoon I wandered around the camp ground following a Red-necked Pademelon and her joey. The next morning there were quite a few feeding on the grass. Going up to the Tree Top Walk there were Brush Turkeys, Crimson Rosellas, Satin Bowerbird, White-browed Scrubwren and Brown Cuckoo-dove. The Tree Top Walk is great. You walk amongst the canopy of the rainforest and even can climb up further to the top of the highest tree. After that, I went to the Green Mountain Gardens, looking for a bower that the ranger told me about, but I could not find it. I did see both male and female Satin Bowerbirds, though. The Border Track goes for about twenty kilometers but I only went along for about one of them. That did me. 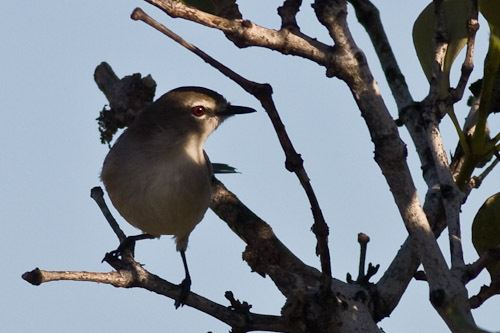 There were lots of White-browed Scrubwren and some Eastern Yellow Robin. 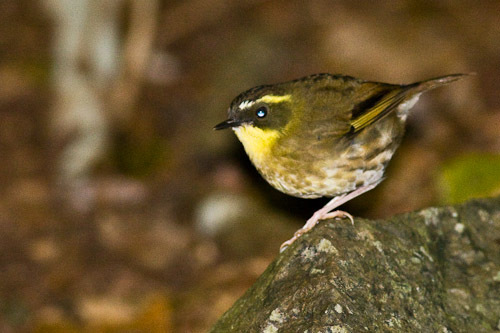 I did manage to get a photo of a Yellow-throated Scrubwren, but had to use flash. Rainforests are not good for photography. A Wonga Pigeon was feeding along the track and was about 2 meters away from me at one stage. A lot of the birds near O’Reilly’s are very used to humans. The next morning I woke up early to clouds and drizzle. On the way back from the toilet, a whipbird was pecking around on the track. Unbelievable. Out in full sight and me without my camera. I rushed back to get it but he would not come out into the open again. So I consoled myself with a cup of tea and a bowl of muesli and set off down the road to Python Rock. This track is 3.1 kilometers return and goes through rainforest and eucalypt forest where the grass trees and hakeas grow. 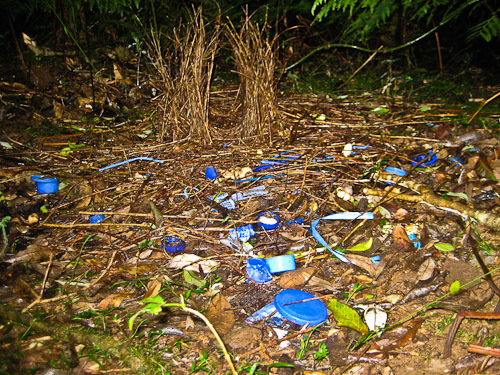 On the way, I spotted a Satin Bowerbird bower. It was just by the side of the road and looked abandoned. 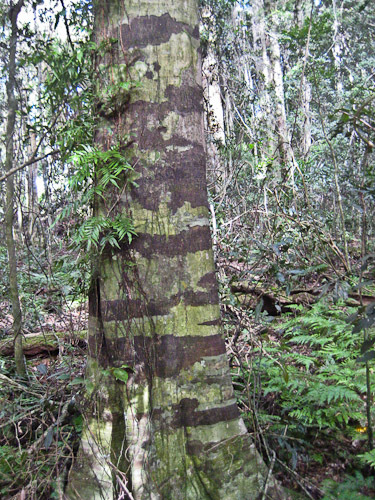 One thing that intrigued me was: “Why do rainforest trees have camouflage designs on them?” There must be a reason. This tree is camouflaged. Why? The other question posed by a sign was “Why do quite a few rainforest trees have buttresses?” I do not know why but know that some New Guinea kids have made surfboards from buttress roots. I was almost back to the track head when I heard this scratching near me. They were a pair of logrunners. I tried to get some photos but it was extremely difficult as they were hiding behind ferns most of the time. Anyhow, I did manage to get a decent photo and here it is. Whew! Any, back to the camp and off to the cafe so I could write this up. I was peacefully having my coffee and this great big Brush Turkey jumps up on the table and starts finishing off someone’s cuppa. 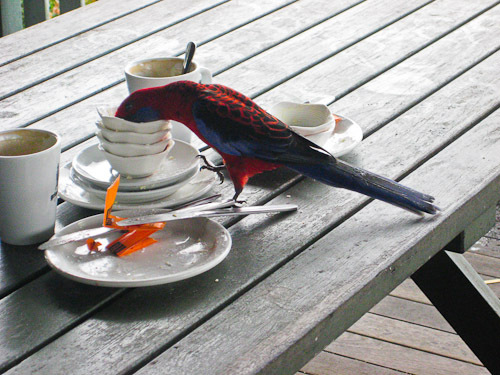 Then the Crimson Rosellas started feeding on the leftovers on another table. Hmm, I am not so sure about feeding birds. 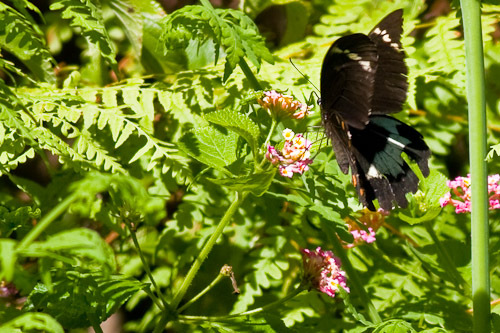 Tamborine Mountain is out the back of the Gold Coast in Queensland. I think it is called the Gold Coast Hinterland. I was on my way to Lamington National Park when I saw the sign, so I just turned off. The road up the mountain is incredibly steep. I wonder why people live at the top of this massive mountain. It boggles the mind. It is also incredibly difficult to find out where things are. But at least in summer time, it is probably nice and cool. Probably like an Indian hill station for the Raj. This morning I went for a walk along the track at The Knoll. 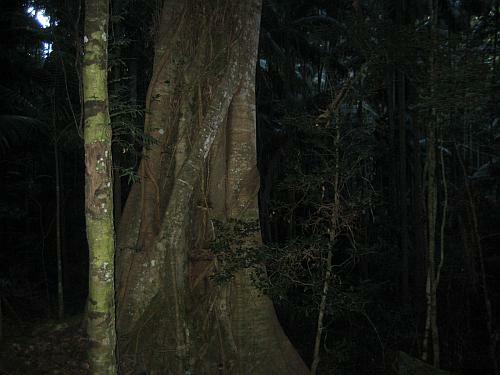 It goes through some great rain-forest, and there are lots of these Strangler Figs. I did not see a lot of birds. There were some Scrub Turkeys scratching around near the picnic ground and I did hear a couple of whipbirds. 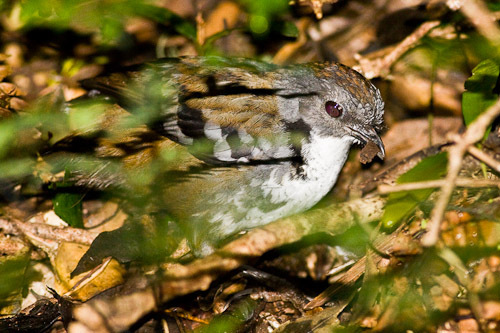 In the rainforest I spotted a Brown Cuckoo-dove and some other indecipherable birds who were scratching around in the leaf litter but the light was so bad I could not even see them properly let alone take a photo of them. Near the water fall, I did manage to see a few Lewin’s Honeyeaters as well as Yellow-faced Honeyeaters. 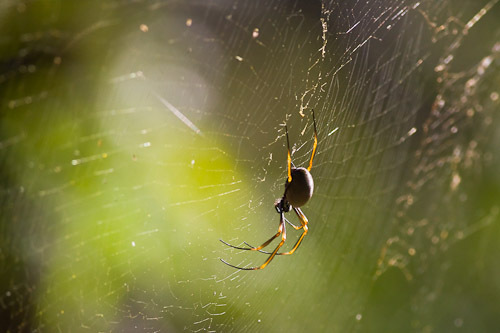 And lots and lots of these spiders, whose webs were shining in the morning sun. In town at North Tamborine, I did manage to spot about half a dozen Blue-faced Honeyeaters playing around on the electricity wires. I did not have my camera with me so there is no photo. doh!